As a retired music teacher, Dorothy Timm Meili wanted to simply inspire others and help when she could. Dorothy led a philanthropic life, planning as she journeyed through each chapter in her story. Her financial advisor encouraged Dorothy to make two charitable gift annuity plans that allowed her to support her favorite charities, while also having dependable income during her retirement years. “I hope my gift will inspire other people to inquire about the benefits of a charitable gift annuity,” said Dorothy when she made her planned gifts. Having the opportunity to give back to her favorite causes only fueled Dorothy’s philanthropic desires. With degrees in piano and music therapy, Dorothy taught music in various communities and states. She grew up on her parent’s farm south of Wood Lake where she attended school, took piano lessons and played piano for virtually every kind of event in the community and church. She graduated from MacPhail College in Minneapolis studying piano, organ and violin. 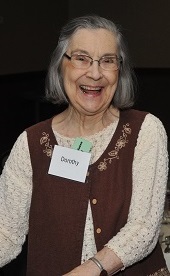 Music continued to inspire Dorothy as she began studying music therapy at Florida State University in the 1960s, while also helping to initiate the music therapy program at Faribault State Hospital in Minnesota, working there as a Registered Music Therapist. In 1977, Dorothy opened and ran a music studio in Faribault, Minnesota until she retired in 1998. In 2001, ten years after her husband’s death, Dorothy moved to Willmar and enjoyed the “healthy music and art climate” here. While Dorothy was able to live out her philanthropic passions during her lifetime, she will also carry out a legacy for years to come. When our dear friend Dorothy passed away in January of 2018, she left her whole heart and soul to the charities and causes that mattered to her most. Dorothy Timm Meili left a permanently endowed estate gift of $250,000 to the Willmar Area Community Foundation and several other transformational gifts to local charities. While Dorothy will be missed dearly by all those who knew her, her song will continue for generations through the generosity and legacy she leaves with us.